Next spring Victor Krummenacher will be releasing his latest album, Blue Pacific. This will mark his ninth solo effort away from his two co-founding bands – the pioneering indie-rock group Camper Van Beethoven and the art-rock collective, Monks of Doom. The inception of this emotionally-charged project started nearly a year after his divorce, and, as it turns out, it’s one-part exorcism and one-part an effort to heal and put it all behind him. Victor Krummenacher’s Blue Pacific will be available March 1st, 2019 on 2-LP vinyl on three sides (limited to 200 copies), CD, digital and streaming formats via Veritas Recordings. Victor will be touring the U.S. next spring in support of Blue Pacific. Dates to be announced in the new year. Founding fathers of the New Romantics and pioneers of the ’80s sound, Visage return with a new album Hearts and Knives. “It has been 29 years since the last Visage album and during that period it often seems like we have all lived through several lifetimes,” comments Steve Strange, the band’s creative force and flamboyant leader singer. Visage began in 1978 when Steve Strange and Blitz Club partner-in-crime Rusty Egan joined forces with Midge Ure to create a futuristic, synthesizer-led group where style and fashion were matched by experimental but accessible music. The group was soon augmented with members of Magazine (John McGeoch, Dave Formula and Barry Adamson) and Billy Currie. They recorded their first single “Tar” with Martin Rushent at his Genetic Studio in 1979 (shortly to become the birthplace of the Human League Dare album). Their breakthrough track “Fade To Grey” became a European hit and reached number 1 in eight countries in 1980. The band then enjoyed a series of hit singles “Mind Of A Toy,” “Night Train” and “The Anvil” coming from a pair genre defying albums, the eponymous Visage in 1980 and The Anvil in 1982. In 1981 Ultravox now led by Midge Ure took off and in 1982 Midge and Billy left to concentrate on what would become one of the biggest bands of the ’80s. In 1984 Visage made their third album Beatboy. As the public face of the band Steve Strange shot to stardom throughout Europe he continued to be active in hosting club nights (The Camden Palace, Club For Heroes) and in the fashion world. In 2010 Steve reconnected with Steve Barnacle and began writing songs once more. Some time later ex-Ultravox guitarist Robin Simon joined the equation, bringing not only a large slice of shared musical DNA (that “Visage sound”) to the project, but also his own distinctive style and ethereal musicianship. Vocalist Lauren Duvall was invited into the fold, adding not only her sultry vocal ability but a slice of the classic Visage glamour too. With the core members in place the picture slowly started forming and the band reached out (once again) to Martin Rushent. He suggested the blueprint for the album and had began working on the first tracks before his untimely death in 2010. The Hearts And Knives album is dedicated to Martin. The album features collaborations and contributions from Dave Formula (former Visage and Magazine keyboard player), Mick MacNeil (the former keyboard player and creative musical core of Simple Minds), ’80s super producer Youth, Rich Mowatt and Logan Sky. The sound of Hearts and Knives is “classic Visage” but with modern songs and style. There is the odd tip of the hat to modern production values but the sound is 1980-1982 Visage. It’s Vintage keyboards and synthesizers all the way. There’s not software synths on this record! The production by John Bryan and analogue synthesizer collector Sare Havlicek is firmly rooted in the ’80s. Many of the tracks are instantly recognizable as Visage (Moogs and the obligatory CR78 drum sound feature on several). Visage (French for “Face”) has always been one part music to one part style & fashion. In 1980 the explosive combination of then futurist synthesizer music, fashion, make up & gender ambiguity set the blue print for the New Romantic movement and eventually the style template of the 1980s. Visage was one of the bands to evolve out of the famous night club the Blitz Club, created and hosted by Steve Strange and Rusty Egan. Other bands included the infamous Spandau Ballet and Culture Club. Innovative style, clothing and make-up continue to be central to brand “Steve Strange.” In a series of style looks for the album he has collaborated with designers Haus of Gaga, Sorapol, Mark Fowler and long time collaborator milliner Stephen Jones OBE. The first album cover in 1980 was shot by veteran music photographer Peter Ashworth in the Blitz Club. Peter returns to shoot the cover of the fourth album. The shot references the famous “Fade To Grey” white face & water motif now displayed on a mask created by Lara Himpelmann. The current day Steve Strange bursts through the mask in a blaze of silver & red. Hearts and Knives may have been a long time in coming but it is a purposeful statement of just where Steve Strange and Visage are at present. The past has been full of highs and lows but musically & creatively they are at a point where they can confidently present an album containing all the strands of their unique mix of music, fashion and style. Visage’s new album Hearts and Knives is due for release in the U.S. June 11, 2013 and will be available on CD, limited edition vinyl and digtal formats through Pylon Records. Fall 2013 U.S. tour dates to be announced soon. WENDY JAMES’ NEW DOUBLE-SINGLE “YOU’RE SO GREAT / IT’S ALRIGHT MA” FEATURING THE STOOGES’ JAMES WILLIAMSON & THE BAD SEEDS’ JIM SCLAVUNOS OUT NOW! On her last solo album, 2010’s critically acclaimed I Came Here To Blow Minds, Wendy James recorded with French indie musicians who shared her passion for NYC punk, Detroit garage and new wave, but now she’s going straight to the source. Working directly with The Stooges’ James Williamson (guitar & bass) and The Bad Seeds’ Jim Sclavunos (drums & percussion) the former Transvision Vamp lead singer has created two stunning tracks on her new double-single that capture the urgency and spirit of not only early punk but rock’n’roll in general. These two tracks are but an early sneak peek at Wendy’s forthcoming solo album. Wendy’s new “You’re So Great / It’s Alright Ma” Double-Single is out now digitally and available through iTunes (purchase here), with a special limited edition 10″ vinyl pressing to be released in the near future. I, like millions of others, begin and end with Bob Dylan. Since I can’t remember when, maybe 12 years old? Bob has been my touchstone. His songs are what I listen to when I need to calm my soul, find my peace, find my strength, affirm my wisdom. Bob Dylan has tracked my soul for all my life so far, and always will. There are of course, so many many perfect moments from him, it’s mind-blowing the simplicity, the complexity, the effortlessness, the timelessness of his words and his melodies. Blood On The Tracks, Bringing It All Back Home, Desire, Slow Train Coming… I mean, I’m just going to list you everything. But… when I was about 13 years old I heard “It’s Alright Ma, I’m Only Bleeding” and that was it for me. He knew everything. Job done. Life explained. So, now, 2012, when James and I had decided to do “You’re So Great” as a special Single Release, he asked me what my favorite Dylan number is and always, ultimately I go to “It’s Alright Ma.” Enthusiastically we decided to record both songs, and then… Let me tell you, there’s a big difference between listening to “Its Alright Ma” and singing it. I understand his rhythm, his intention, his breath, his humor, his message, to be clear: I understand his choice of words. It was heaven in the studio, losing myself on the microphone, telling the tale, singing the truth, having my few hours bathing in that High White Noise… and James in the control room watching on proudly…Yes. It was a good day… It was the kind of day that explains exactly, innately, why one does this in life. Fresh, sweet soul from Akron’s Wesley Bright & The Honeytones. After going through some changes in both personnel and sound, Wesley and the guys have found their groove. This tune represents a new direction for the band, produced by Colemine Records’ in-house producer Leroi Conroy at their Loveland, OH studio. These tunes are rough and tough, yet super sweet as well. Maybe that’s because lead singer Wesley Bright is also a beekeeper. That’s right. He’s a sweet soul singer that makes honey. You can’t make that up. Where Is Parker Griggs? is a collection of songs from the Alive Naturalsound label, with EXCLUSIVE MATERIAL by HACIENDA, RADIO MOSCOW, BUFFALO KILLERS, BLACK DIAMOND HEAVIES and more. This compilation showcases the many facets of this respected L.A. based indie imprint, founded by Patrick Boissel 17 years ago. From garage rock, psych, punk, deep blues and Tejas garage-soul, Where Is Parker Griggs? is an impressive overview of some of the new blood currently pumping through Alive – the first label to have the taste and insight to sign not only The Black Keys and Two Gallants, but all of the remarkable acts on this collection (not to mention many others). This album also features an early preview from Alive’s latest signing, the rootsy psyouthern soul of Birmingham, AL rock quartet LEE BAINS III & THE GLORY FIRES, whose full-length debut lands April 2012. Where Is Parker Griggs? will be released January 10th as a 180 GRAM VINYL Ltd. Edition and Digital download, the latter which also features two additional bonus tracks from LEFT LANE CRUISER and THE BLOODY HOLLIES. So where exactly is Radio Moscow’s singer, guitarist and creative fountainhead, Parker Griggs? Actually, we don’t have a clue. 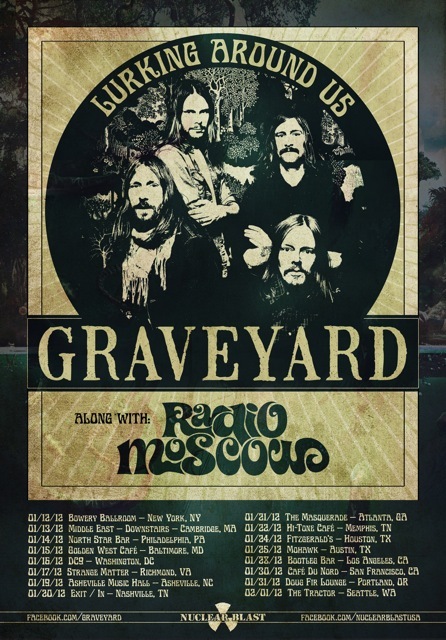 But we do know that in January he’ll be out on the road fronting Radio Moscow for a handful of explosive Midwest shows in support of their latest Alive album, THE GREAT ESCAPE OF LESLIE MAGNAFUZZ. The northern California (by way of central Iowa) trio will then be teaming up with Swedish hard-rockers GRAVEYARD for a coast-to-coast winter tour. You can pin Parker down in one of the cities below as part of this super-heavy, mind-bending double bill! THE WHISKEY GENTRY TO RELEASE THEIR NEW ALBUM DEAD RINGER APRIL 7, 2017 ON VINYL, CD AND DIGITAL FORMATS VIA PITCH-A-TENT RECORDS! Following the release of their first two acclaimed albums, Please Make Welcome (2011) and Holly Grove (2013), the Atlanta-based band The Whiskey Gentry are set to release their third full-length studio album entitled Dead Ringer this spring. On it, the husband and wife duo of Lauren Staley & Jason Morrow and bandmates have created an effort that builds on many of the sounds of their previous albums – incorporating deep country, Americana, honky-tonk, bluegrass and a stiff shot of gritty rock ’n’ roll, yet it also finds the band testing themselves and pushing beyond their own boundaries. The Whiskey Gentry has been tearing up the road for the better half of the last decade, logging over 150 shows each year, and winning over crowds at major festivals such as Shaky Knees, Shaky Boots, Merlefest, Bristol Rhythm & Roots Reunion, FloydFest and many others. With the release of Dead Ringer they’ll continue this trend, bringing their raucous, high-energy shows to audiences from coast-to-coast. The Whiskey Gentry’s Dead Ringer will be available on limited vinyl, CD and digital formats on April 7th via Pitch-A-Tent Records. WHITE NOISE SOUND is the eponymous debut from the Swansea / Cardiff, Wales-based sextet. Completed with the help of Pete Kember (Spacemen 3, Spectrum and E.A.R) and magician Cian Ciaran (Super Furry Animals), the album is the realization of a band conjuring their own particular wall-of-sound – at once relentlessly pulsating and blissed-out. The band had honed their craft across the UK and through Germany where they supported the likes of The Warlocks, Spectrum, Mark Gardener (Ride) and the Super Furry Animals, and shared the stage with members of Spacemen 3 and Spiritualized. WHITE NOISE SOUND is a psychedelic dream-piece. It will be available on 9/21/10 on CD and PURPLE VINYL, ltd. edition of 700. The LP comes with an alternative cover. FIRST REISSUE EVER, ON ANY FORMAT of this sought after collectors’ album of Southern Soul and pop gospel. Wolfmoon, aka Little Tommy, hails from Richmond, VA and is without a doubt one of the most talented performers Swamp Dogg has worked with and produced. This terrific album includes great cover songs of “People Get Ready,” “If I Had A Hammer” and “Proud Mary,” along with originals penned by The Dogg. The album art is a beautiful psychedelic illustration reminiscent of the ’70s. Ltd. ed. color vinyl with original gatefold jacket available from Bomp-mailorder.